I would like to permit myself to start with some not entirely pleasant thoughts. Regretfully, we have never lived to see fierce and desperate finishing battles. Professionalism and desire to secure a required or at least almost required result were the characteristic features of the games between leaders. It's a rare case when "+3" is enough to take the first place in the 11-round Swiss system competition. There is no point in blaming some of the participants – everyone has been solving his own tournament tasks. I can only assert that the existing system of the whole event is not really conductive to creative play, spectator's interest and uncompromising fights in the last ditches. The temptation to make a head start and then to happily cruise to a finish in a comfortable boat of draws is much too great. Sothat'sallaboutthat. Nevertheless, there was enough good quality chess material in the last rounds of the tournament. And how could it be otherwise in such a high-ranking event? Konstantin Sakaev in a classic style won the game in a popular Slav Defense variation against hard-to-defeat Vladimir Malakhov. 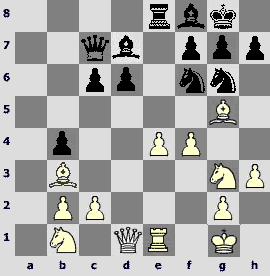 11.g3.In this variation of the Chebanenko System Black has rather poor statistics. The bishop's development to g2 enhances the effect of the e2-e4 advance. After the b7-b6 attack the weakness of c6-pawn becomes still more tangible. 11...Ґg7 12.Ґg2 O-O 13.O-O b6N. A novelty. 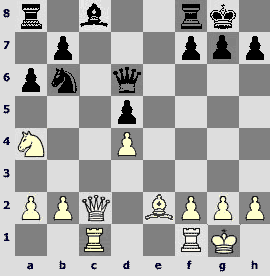 It is hard to say in what way this move is stronger than previously occurred 13...¦e8. 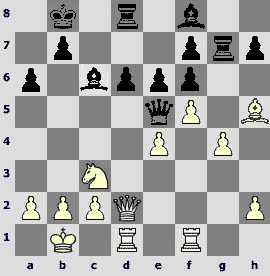 14.b4 Ґb7 15.¦ab1 ¦e8 16.¦fd1!A prophylactic move. White gets an X-ray attack along the d-file. 16...Јc8. It's disadvantageous to play 16...e5 17.dxe5 ¤xe5 18.¤xe5 ¦xe5 because of 19.e4!, and 19...dxe4? 20.Ґf4! is bad. 17.¤a4!The knight's shuttle maneuver leads to closing of the Q-side. 17...b5 18.¤c3 e5. 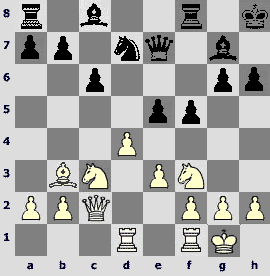 On any passive continuation White would play e2-e4 all the same. 21.e4! 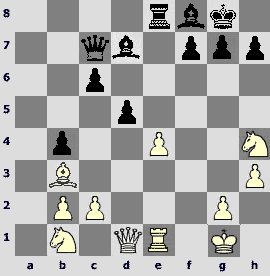 Central pawns get exchanged, and one can state that White is obviously better prepared for the open fight. 21...dxe4 22.¤xe4 ¤xe4 23.Ґxe4 Јe6? !It was worth it to withdraw the rook from the center immediately. After 23...¦e8 24.Ґf3 Јe6 Black is ready to bring his queen's rook into a play. 24.Ґf3 Јf6 25.Ґf4 ¦e7 26.¦d6 ¦e6 27.¦xe6 Јxe6 28.Јd2!A competent decision. It is more important to occupy the open central file that is more distant from the king. 28...Јf5. On 28...¦e8 there would have followed 29.¦d1 Ґf6 30.Јd7! Јxd7 31.¦xd7 ¦e7 32.¦d8+! ўg7 33.ўg2! Black is completely helpless as he has no adequate defense against 34.Ґd6. 29.¦e1. Now Konstantin possesses both central files. 29...Ґf8. Bad is 29...g5? because of 30.Ґe4. 30.ўg2 a5 31.a3 axb4 32.axb4 h5 33.h4. The preparatory work is over. White is going to fortify his position by means of 34.¦d1 followed by his queen's invasion on d7. 33...Јc8. And what else is there to do? If 33...¦a3, then 34.¦e8. 34.Ґe5 Јd8 35.Јf4 Ґg7 36.¦d1 Јe7 37.Ґxg7 ўxg7 38.¦d6. Every next exchange makes the difference in strength of the light-squared bishops still greater. 38...¦e8 39.Јd4+! Certainly not 39.Ґxc6? Ґxc6+ 40.¦xc6 Јe4+ 41.Јxe4 ¦xe4=. 39...Јe5. Or else 40.¦d7 decides the issue. 44.Ґd1! Stressing another black weakness, namely the f7-pawn. Konstantin Sakaev confidently brings the game to a win. 44...¦e1. 44...¦d5 leads to an instructive bishop ending. After 45.¦xd5 cxd5 46.ўf3 ўf6 47.ўe3 ўe5 48.f4+ ўe6 49.ўd4 f5 (on any other move White wins in the same way) wins 50.c6! Ґxc6 51.ўc5 Ґd7 52.Ґb3ќ. 45.Ґb3 ¦b1 46.¦xf7+ ўh6 47.Ґc2 ¦b2 (47...¦xb4 48.¦f6 ¦g4 49.f4ќ) 48.Ґd3 ¦xb4 49.¦f6. BlackK-sidepawnsfall one after another. In the following game the technical methods of struggle also prevailed. Evgeny Tomashevsky managed to sort out the subtle positional nuances better and to defeat one of the future tournament victors. 1.c4 c6 2.¤f3 d5 3.e3 ¤f6 4.¤c3 a6 5.Јc2 e6 6.d4 c5 7.cxd5 exd5 8.Ґe2 ¤c6 9.¤e5. Evgeny deviates from the mainline 9.0-0 in favor of a less investigated continuation, which nevertheless is not devoid of its poison. 9...Јc7 10.¤xc6 Јxc6. 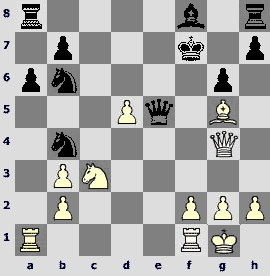 10...bxc6!, following the game Milov – Jakovenko, Warsaw 2005, is maybe more accurate. 13...O-O. White does not mind 13...Ґxc3 14.bxc3 with tangible advantage. 14.¦ac1 Ґd6. On 14...¦e8 there is an unpleasant reply 15.Ґf3. 15.Ґe5!Seeking to exchange the dark-squared bishops in the most favorable circumstances. 15...¤d7? !Opening up of the center by means of 15...Ґxe5 16.dxe5 ¤g4 17.Јb3 ¤xe5 18.¤xd5 Јe6 19.¦fd1 is obviously in favor of White – Black has serious problems with development. The best way out is a lunge 15...¤g4! 16.Ґxd6 (or 16.Ґxg4 Ґxg4 17.Ґxd6 Јxd6) 16...Јxd6 17.g3 ¤f6 obtaining a bit worse but still quite an adequate play. The knight on d7 is placed badly – now it becomes much more difficult to develop the Q-side. 16.Ґxd6 Јxd6 17.¤a4!The c7- and c5-squares are fine ones for an invasion. 17...¤b6. The alternative is 17...b5 18.¤c5 ¤f6 19.¦fe1 ¦e8 20.Ґd3 Ґd7. One certainly wouldn't want to weaken dark-colored squares, but queens remain on the board. 18.Јc5! The transition into an endgame is favorable for White. 18...Јxc5 19.¤xc5 ¦d8. On 19...¤d7 there follows 20.¤d3!±. 20.¦fe1 ўf8 21.Ґf3 ¦d6 22.b3 ¦b8. Here 22...¤d7 does not solve the defensive problems as well in view of 23.¤d3!±. 23.¦e5 Ґe6? !As it frequently happens, it a bad position you make bad moves. More accurate is immediate 23...Ґd7. 24.¦ce1 Ґd7 25.¦1e3 Ґc6 26.Ґg4! ¦dd8. And now on 26...¤d7 there would follow 27.Ґxd7! Ґxd7 28.¦e7±. 27.f4 ¦e8 28.ўf2 ¦bd8? !White leads the game well, systematically fortifying his position, but things are still not in a hopeless way for Black. He could have held his own long and stubbornly after 28...f6! 29.¦xe8+ ¦xe8 30.¦h3 h6 31.¦c3 ¤c8! 29.h4 a5? !Not an obligatory move at all. This pawn becomes another weakness. It would be better to admit the mistake by way of 29...¦b8! followed by f7-f6. 30.a4! ¦xe5? !Here it seems worth it to think about 30...¦b8! 31.fxe5. 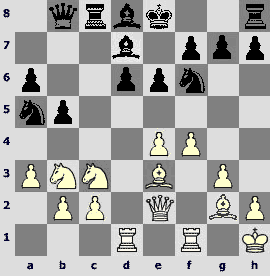 Now the f7- and g7-pawns become vulnerable, and the move e5-e6 is possible. 35.¦c3! Evgeny hampers b7-b6 and gradually begins to look closely at the far-advanced infantryman on a5. 35...ўf8. On 35...b6 there follows 36.¤e4! Ґd7 37.¤d6 Ґxf5 (37...¦f8 38.Ґxd7 ўxd7 39.¦g3) 38.¤xf5+ ўf8 39.¦g3ќ – the g7-pawn falls. 36.ўg3 ¦e7 37.¤d3!The c5-square is vacated for the rook. 37...¤c7 38.¦c5 Ґd7. Nothing changes after 38...g6 39.hxg6 fxg6 40.Ґc8. 39.Ґxd7 ¦xd7 40.¤f4. 40.¦xa5 is also possible, not being concerned for 40...¤e6 in view of 41.¤c5!ќ. 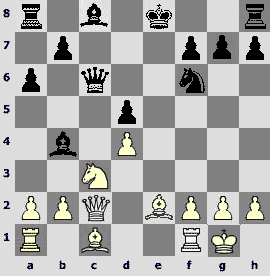 40...b6 41.¦c6 b5 42.ўg4!The triumph of White's strategy – his opponent practically gasps for breath. The spatial advantage quickly transforms into a material one. Marat Makarov made Alexander Lastin solve knotty problems as early as in the opening. The whole game had been going on under the sign of the white initiative and ended with his deserved win. 1.d4 d5 2.c4 c6 3.¤f3 ¤f6 4.¤c3 e6 5.Ґg5 h6 6.Ґxf6 Јxf6 7.e3 ¤d7 8.Ґd3 dxc4 9.Ґxc4 g6 10.O-O Ґg7 11.Јc2 O-O 12.¤e4 Јe7 13.Ґb3 e5 14.¤c3 ўh8 15.¦ad1.In this way Vladimir Kramnik played against Jeroen Piket (Monaco 2002). 15...f5. Jeroen had chosen a more quite move 15...b6, but also lost the game. 16.d5!N. Clearly stronger than previously tested 16.e4. 16...e4. On 16...¦d8 highly interesting is 17.Ґa4! ?, making Black decide on the c6-pawn. 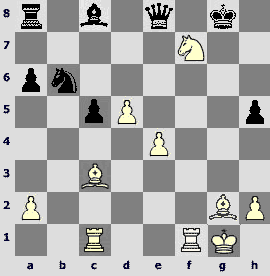 17.¤d4 ¤e5 18.¤ce2!Marat finds an ideal stand for his knight. 18...Ґd7. After opening up the game 18...cxd5 19.¤f4! ¦d8 20.¤xd5 white knights dominate. 19.¤f4.It is premature to play 19.d6 because of 19...Јe8!, planning to begin rounding up the pawn after ¦f6. 19...¦fc8? !The rook is out of the picture here. Stronger is 19...¦fe8! 20.d6 Јf6 covering the e6-square. 20.d6! Јf6. Bad is 20...Јxd6 21.¤xf5±. 21.¤de6!An unpleasant invasion. The knight is ready to jump on c5 or c7 from here. 21...¦ab8? !A not-quite-obvious loss of a pawn. White advantage is tangible, so Black should have tried to change the character of the struggle by means of 21...¤d3! ?, making the opponent choose whether to win a pawn and weaken the king's cover: 22.¤xg7 ¤xf4 23.¤xf5 ¤h3+ 24.gxh3 Ґxf5, or to sacrifice an exchange: 22.¦xd3!? exd3 23.Јxd3. In my opinion the latter way looks more promising, as compensation for the exchange appears more than adequate. 22.Јc5! A double attack against the a7- and e5-squares. 22...ўh7. On 22...b6 there would follow 23.Јxe5! Јxe5 24.¤xg6+ ўh7 25.¤xe5 Ґxe5 26.f3±, and the attempt to keep material advantage by means of 22...¤d3 23.¤xd3 exd3 24.¤xg7 ўxg7 25.¦xd3 Јxb2 hits on 26.¦c3! with black queen getting cut off from the K-side. 23.Јxa7 b6 24.¤xg7 Јxg7 25.Ґe6 ¦d8. It is possible to transpose the game into an ending – 25...Ґxe6 26.Јxg7+ ўxg7 27.¤xe6+ ўf6, but after accurate 28.d7! ¤xd7 29.¦xd7 ўxe6 30.¦fd1 ўe5 31.¦7d6!± Black is in trouble. 26.Ґxd7 Јxd7 27.Јa3 g5 28.Јc3 ¦e8. If 28...¤f7, then 29.¤h5 ўg6 30.¤g3 ¤xd6 31.f4! exf3 (31...g4 32.Јe5 followed by 33.¤f5) 32.¦xf3±. 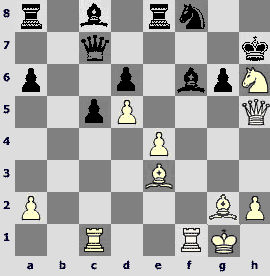 31.f3!Stresses the insecurity of black king's position. 31...exf3 32.gxf3 ¦f8. One cannot play 32...¦xd6? because of 33.Јxe5 ¦xd1 34.Јxb8ќ. 33.Јd4? !A temporary sacrifice of the pawn 33.f4! gxf4 (33...¤g4 34.e4) 34.¦xf4 ¦xd6 35.¦df1! 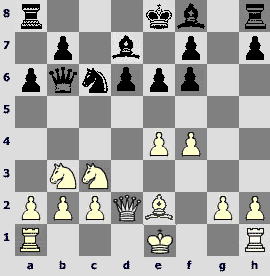 permits White to activate all his forces, to win the f5-pawn and to continue the attack against the king. 33...c5? !Maximal difficulties are created by 33...¦ff6! 34.Јxb6 ¦xd6 35.¦xd6 Јxd6 – black pieces are active, white king is no more secure than its black counterpart, and the extra pawn is immaterial. 34.Јd5 f4. Now on 34...¦ff6 there follows 35.e4!, and 35...¦xd6 is refuted by way of 36.Јg8+! 35.Јe4+ ўg7 36.exf4 ¤g6 37.¤h5+ ўh8 38.Јd5 gxf4?Leads to a quick defeat. The only way to hold on is 38...¤xf4! 39.¤xf4 ¦xf4 40.¦fe1 ¦ff6 41.¦xe6 ¦xe6, and Black still has some hopes for salvation. 39.¦fe1 ¦xe1+. Other possibilities are equally bad: 39...¦e3 40.¦xe3 fxe3 41.Јe4ќor 39...¦fe8 40.¦xe6 ¦xe6 41.ўh1!ќ, threatening to sacrifice the queen on e6. Anton Shomoev clearly demonstrated how to play in one of the popular Sicilian Defense structures. 1.e4 c5 2.¤f3 d6 3.d4 cxd4 4.¤xd4 ¤f6 5.¤c3 a6 6.Ґg5 e6 7.f4 Јb6 8.Јd2 ¤c6. 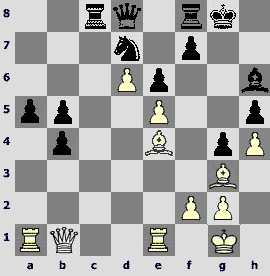 Black reject the principled move 8...Јxb2, proposing the transition from the Najdorf Variation into the Rauzer System. 11...¦g8. More usual is 11...h5, but Black prefers to defend the f7-pawn with the rook from g7 – this brings some originality into a typical position. 12.Ґh5 ¦g7 13.O-O-O O-O-O 14.ўb1!?N. Previously they played14.¦hf1 immediately. 14...ўb8. To the same situation leads 14...¤a5 15.¤xa5 Јxa5 16.f5. 15.¦hf1 ¤a5 16.¤xa5 Јxa5 17.f5!Weakening of the e5-square is not so important – it can be occupied only by black queen, and after that the apparent invulnerability of this piece turns out to be deceptive, as we will see. 17...Јe5 18.g4!? An interesting decision. While blocking up his bishop on h5, Anton at the same time securely fortifies the f5-square and ties his opponent's hands with defense of the f7-pawn for a long time. 19.¦fe1! Preparing the lunge 20.¤d5! 19...Ґe7? !Playing into White's hands, but black position has already been anything but good anyway. On 19...¦c8 there follows 20.¤d5! exd5 21.exd5 Јxd5 22.Јxd5 Ґxd5 23.¦xd5± all the same, with great advantage in the endgame, and on 19...Јc5 there is an unpleasant move 20.Јf4! 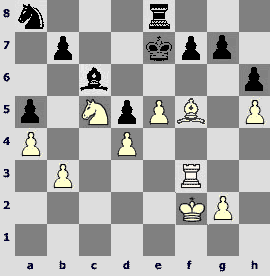 – White looks closely at the f6-square intending after 20...Ґe7 to play 21.¤d5!± once more. 20.¤d5! Ґf8. Black has to retreat his bishop back into place – playing without the queen after 20...exd5 21.exd5 Ґxd5 (on 21...Јxd5 wins immediately 22.Јh6ќ) 22.¦xe5 dxe5 23.Јh6± promises him no rosy skies. 21.Јf2!Anton keeps up the pressure. 21...¦c8. After 21...exd5 22.exd5 Ґxd5 23.¦xe5 dxe5 24.b3± the compensation for the queen is obviously inadequate. 22.¤b6 ¦c7? !It's been worth it to withdraw – 22...¦d8, keeping the 8th rank under control. 23.¦d5! The d5-square, that looks so securely reinforced, becomes the target of the tactical blow for the second time already. 23...exd5 24.exd5 Ґe8. Trying to obtain two rooks for the queen is no good – after 24...Јxe1+ 25.Јxe1 Ґb5 26.a4 ¦e7 27.Јb4 Black cannot escape great material losses. 25.¦xe5 dxe5 (if 25...fxe5, then 26.Јh4!ќ) 26.Јd2 ўa7(26...Ґd6 27.Јh6!ќ) 27.d6! This move decides the issue once and for all. 27...¦c6. On 27...ўxb6 the way to win is 28.Јb4+ followed by 29.dxc7. The next two games look like twins. «The knight on the edge of the board is a shame", – Dr. Tarrasch used to teach us. Get some added evidence of maestro's being right for yourselves. 1.e4 c5 2.¤c3 ¤c6 3.¤f3 e6 4.d4 cxd4 5.¤xd4 Јc7 6.g3 a6 7.Ґg2 d6 8.O-O Ґd7 9.¤b3 Ґe7 10.f4 ¤f6 11.Ґe3 ¤a5?The second knight's move in a row, and to the edge of the board at that, is an outrageous breach of the opening laws. Boris Grachev is not the first one to make this particular mistake. Better is 11...0-0 or 11...b5. 12.e5! Just the time for a breakthrough in the center. 12...dxe5N. 12...¤c4 13.exf6 ¤xe3 14.Јd3 ¤xf1 15.fxe7± is unfavorable for Black as well. 13.fxe5 ¤c4. Loses 13...Јxe5? 14.Ґf4 Јf5 15.Ґc7ќ. 14.exf6! 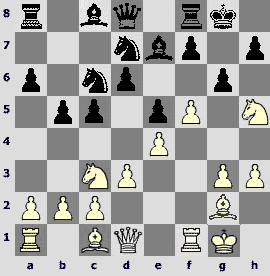 ¤xe3 15.Јd4!There is no need to defend the c2-pawn. 15...¤xf1. If 15...¤xc2?, then 16.fxg7 ¦g8 17.Јf2!ќ. 16.fxe7 ¤xg3 17.hxg3 ўxe7 18.¦f1!In terms of material Black is not so badly off, but his position is absolutely lost. 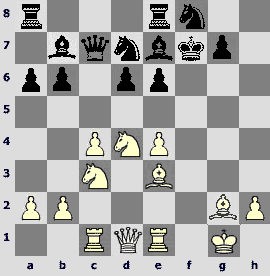 Black king is stuck in the center and is fired at by the active white pieces; besides, the b7, f7 and g7-pawns hang. Now there is a threat of 19.Јb4+, and 19...Јd6 is impossible because of 20.¦xf7+. 18...f6. Fortifying the K-side but permitting the knight's jump on c5 at the same time. 19.¤c5! ¦he8. Neither 19...Ґc6 20.Јg4!ќ nor 19...Јd6 20.Јe3 Ґc6 21.¦d1ќ help. 21.¦e1! ўf8 (21...¦xb7 22.¤d5+ќ) 22.Јc5+ Јxc5+ 23.¤xc5. The endgame is easily won. 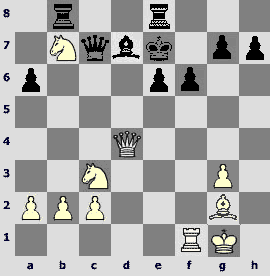 White knights dominate, and the passed c-pawn will begin its advance soon. 1.e4 c5 2.¤f3 d6 3.d4 cxd4 4.¤xd4 ¤f6 5.¤c3 a6 6.g3 e6 7.Ґg2 Јc7 8.O-O Ґe7 9.Ґe3 ¤c6 10.f4 Ґd7 11.¤b3 ¦c8 12.ўh1 b5 13.a3 Јb8?! 14.Јe2 Ґd8?!N.Adubiousversionofthevariation. Black consistently prepares ¤c6-a5, but this idea is incorrect. 16.e5! Here the breakthrough in the center is still more terrible for Black than in the previous example. 16...dxe5 17.fxe5 Јxe5 18.Јd3!A subtle move of the destructive force. There is a threat of taking on f6, and Black is unable to strengthen the d7-bishop adequately. 18...¤c4. Neither 18...¤xb3 19.¦xf6! nor 18...O-O 19.Ґd4 help. 19.¦xf6! O-O. If 19...Јc7, then 20.¦f2 ¤xb2 21.Јxd7+! Јxd7 22.¦xd7 ўxd7 23.Ґd4ќ. 20.¦f3. White is a piece up, and the opponent's tactical extravaganzas are easily nipped in the bud. 20...Ґc6 21.Ґd4 Јb8 22.¤e4 e5 23.Ґc3 f5 24.¦df1!The curtain can be safely dropped. Another easy win. The scenario is rather simple: one chessplayer knows his theory, and another one has got it all wrong somewhere. The result is a textbook rout "after well-known patterns". 1.¤f3 ¤f6 2.g3 b6 3.Ґg2 Ґb7 4.O-O e6 5.c4 c5 6.¤c3 Ґe7 7.¦e1 d6 8.e4 a6 9.d4 cxd4 10.¤xd4 Јc7 11.Ґe3 O-O 12.¦c1 ¤bd7 13.f4 ¦fe8 14.g4.In one of the fashionable subvariations of the "hedgehog" system Pavel chooses an aggressive continuation. 14...h6?! That's strange – Valerij agrees to the variation that is rejected by theory with nothing of his own to offer. Thecorrectmoveis 14...¤c5 with complex play. 15.g5! hxg5 16.fxg5 ¤h7 17.g6! All this have already occurred more than once before. Black king's pawn cover is in ruins. 19.¤d5! Not giving his opponent time to recover. 19...exd5 20.cxd5 ¤c5N. The knight goes to its doom. After that White keeps on waging his attack enjoying a material equality already. The source game ended in the following way: 20...Јd8 21.¤e6 ¤xe6 22.dxe6+ ўxe6 23.Ґh3+ ўf7 24.Јh5+ g6 25.Јh7+ ўf6 26.¦f1+ ўe5 27.Ґf4+ ўd4 28.¦fd1+ ўxe4 29.Јxg6+ ўxf4 30.Јg4+ 1-0 Pogorelov – Rodriguez Lopez, Mondariz 1999. 21.b4 Ґf6 22.bxc5 bxc5 23.¦f1 ўg8 24.¤f5. Tougher is the computer 24.¦xf6! gxf6 25.¤f5. Black loses in all the variations: 25...Ґc8 26.Јg4+ ўh8 27.Јh5+ќ; 25...¤g6 26.Јg4 ўf7 27.Јh3 ¦h8 28.Јg3 ¦ad8 29.Ґxc5ќ; 25...¤h7 26.Ґf4 ¦ad8 27.Јh5ќ; 25...ўh8 26.Ґf4 ¦ed8 (26...¦ad8 27.¤xd6) 27.¦c3 ¤h7 (27...¦d7 28.¦g3) 28.¦g3 ¦d7 29.Ґh6 ¦g8 (29...¦ad8 30.Јh5) 30.¦xg8+ ўxg8 31.Јg4+ ўh8 32.¤h4ќ. 27.¤g4+! Pavel Maletin sacrifices his strongest piece and makes spectators a present of the elegant ending. 27...gxh5 28.¤xf6+ ўh8. Or 28...ўg6 29.¤xe8 Јe7 30.¦f6+ ўh7 31.¦h6+ ўg8 32.¤f6+ ўf7 (32...ўg7 33.¤xh5+ ўg8 34.Ґf4) 33.¦f1ќ. 29.¤xe8 Јe7 30.¤xd6! ¤d7 (30...Јxd6 31.Ґxc5ќ) 31.¤f7+ ўg7 32.Ґg5 Јe8 33.Ґd2. In such situations one should choose a way to reach his goal and follow it exactly. 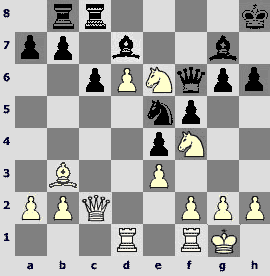 Also win both 33.e5 ¤xe5 34.¤d6 Јg6 35.Ґf6+ and 33.Ґh6+ ўg8 34.¦f5. 35.¦f6! The invasion on the 6th rank is most effective. 35...¤xd5 36.¦g6+! ўf8. On 36...ўxf7 there is 37.¦g7+ ўe6 (37...ўf8 38.¦f1+ ¤f6 39.Ґxf6) 38.exd5+ ўd6 (38...ўf5 39.¦f1#) 39.¦e1ќ with a win. It is much more difficult to sort out all the cobwebs in Mikhail Kobalia's game against Denis Khismatullin. The opponents had really gone on the warpath, and attack turned out to be stronger than defense. 1.e4 c5 2.c3 ¤f6 3.e5 ¤d5 4.¤f3 ¤c6 5.Ґc4 ¤b6 6.Ґb3 d5 7.exd6 Јxd6 8.¤a3 Ґe6 9.d4 cxd4 10.¤b5 Јd7 11.O-O! ?In order to aspire to something in the Sicilian Defense with early c3 you often have to play in a gambit style. Mikhail is in the mood just for this. He rejects the unpretentious 11.Ґxe6 Јxe6+ 12.Ґe3 Јd7 13.¤bxd4 with approximate equality. 11...Ґxb3 12.axb3 e5N. Acourageousreply. Denis understands that he is liable to get under the attack, but has faith in the defensive resources of his own position. 13.cxd4 a6 14.d5! Rendering blow for blow. 14...¤b4. The faint-hearted 14...axb5? 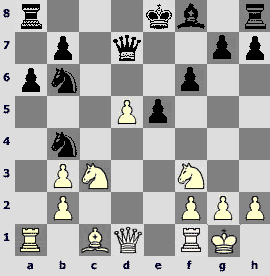 15.¦xa8+ ¤xa8 16.dxc6 Јxd1 17.¦xd1 bxc6 18.¤xe5 leads to a difficult ending. 15.¤c3. Less interesting is15.¤xe5 Јxb5 16.¦e1 O-O-O 17.¤xf7 Ґc5 18.¤xh8 ¦xh8. 16.¤xe5! A purely intuitive sacrifice. To calculate every variation in such a situation is impossible. 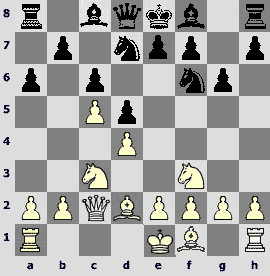 White hampers the opponent's king in the center and quickly mobilizes his forces. 16...fxe5 17.Јh5+ Јf7. An important positional nuance is that the b6-knight is unprotected. It shows in the variation 17...ўd8 18.Ґe3! (18.Јxe5 Ґd6 19.Јd4 ўc7) 18...¤c8 (18...¤6xd5 19.¤xd5 ¤xd5 20.¦fd1) 19.¤e4! – the knight seeks to get on e6 or f7 via the g5-square. 18.Јxe5+ Јe7. On 18...ўd7 there is once again a strong reply 19.Ґe3! Ґd6 (19...Јg6?! 20.Ґxb6 Јxb6 21.d6! ¦e8 22.Јf5+ ўd8 23.¦ac1 ¤c6 24.¤a4 Јa7 25.¤c5 ¤e5 26.¦fe1) 20.Јd4 ¤c8 (20...¤6xd5 21.¤xd5 ¤xd5 22.¦fd1) 21.Јg4+ ўe8 22.¤b5 ¤xd5 23.¦fe1 with dangerous threats. 19.Јh5+ g6?!Aninaccuracy. Black shouldn't have disturbed the K-side pawns. Strongeris19...Јf7! Then it is possible to play 20.¦e1+ (20.Јe2+ Јe7 21.Јf3 Јf6) 20...Ґe7 21.Јh4!? (in case of 21.¦xe7+ ўxe7 22.Јh4+ ўe8! 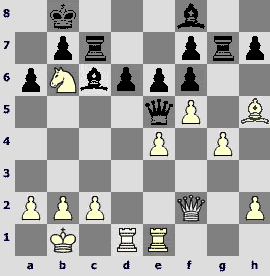 23.Јxb4 ¤xd5 White has compensation for the exchange, but nothing more than that) 21...¤4xd5! (21...ўf8? 22.Ґg5 ¤4xd5 23.Ґxe7+ ¤xe7 24.Јb4 Јf6 25.¦ad1!ќ) 22.Ґg5 ¦d8! (22...¤f6 23.Јb4 ¤bd7 24.Ґxf6 ¤xf6 25.Јxb7 ¦d8 26.¦xa6 ўf8 27.¦a7 ¤d7 28.¦d1) 23.¤xd5 ¤xd5 24.Ґxe7 ¤xe7 25.¦ac1, and here Black can play, for example, 25...O-O 26.¦xe7 Јxb3= returning an extra piece and getting an absolutely equal play. 20.Јg4. Mikhail chooses a most natural-looking retreat and misses an opportunity to gain from Black's oversight. In case of 20.Јf3! it is risky for Black to play 20...O-O-O 21.Ґf4!, and on 20...Ґg7 there follows 21.d6! Јxd6 22.¦e1+ Ґe5 23.Ґf4‚ ¤d3 24.Ґxe5 ¤xe5 25.¦ad1 Јe6 26.Јg3±. 20...ўf7. On 20...¤c2? the issue is decided at once by 21.Јd1! ¤xa1 22.¦e1ќ, and after 20...¤4xd5 21.¤xd5 ¤xd5 22.Јd4 ¤f6 23.Ґg5 ўf7 24.¦fe1 Јd6 25.Ґxf6 Јxd4 (25...Јxf6 26.Јd5+ ўg7 27.Јxb7+) 26.Ґxd4 White has a healthy extra pawn in the endgame. 21.Ґg5!Bad is 21.Јd4? because of 21...¤c2!, and on 22.Јxh8 there is 22...Ґg7 23.Јxh7 ¦h8 with black advantage. 21...Јe5?A decisive mistake. It was necessary to find a series of the only moves: 21...Јd7! 22.Јd4 ¤4xd5 23.¤xd5 (23.Јxh8 Ґg7 24.Јxh7 ¦h8) 23...Јxd5! (23...¤xd5 24.Јxh8 Ґg7? 25.Јxa8) 24.Ґe3 (24.Јxb6 Јxg5 25.Јxb7+ Ґe7!) 24...Јxd4 25.Ґxd4 Ґg7 26.Ґxb6 ¦he8=, and there is an equal ending on the board. 22.Ґe3! It's not just an attack on the knight, it's a double attack. 22...Ґd6. After any other reply the unprotectedness of the h8-rook will tell: 22...¤c8 23.Ґd4; 22...¤c2 23.Ґxb6 ¤xa1 24.Ґd4. 23.Јe6+ Јxe6 24.dxe6+ ўxe6 25.Ґxb6. White already has material advantage. Blackking'sunenviablepositionmakeshis situation hopeless. 25...¦ac8 26.¦ad1 ¦c6 27.¦fe1+ ўf7 28.Ґa5!Mikhail is precise to the end. 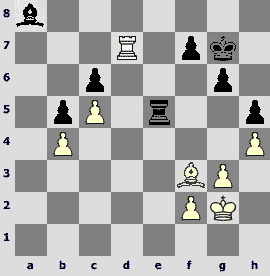 In a few moves White has won two pieces for a rook, and the technical stage is of no particular interest. Sergei Rublevsky was no less fierce in storming his opponent's bastions and won seemingly easily. But the analysis shows that everything hasn't been so simple. 1.e4 c5 2.¤c3 e6 3.¤ge2 d6 4.g3 ¤c6 5.Ґg2 ¤f6 6.O-O a6 7.h3 Ґe7 8.d3 O-O 9.f4 ¤d7!?N. This not devoid of originality move pursues several objects. Black has prepared b7-b5, he is ready after f4-f5 to occupy the e5-square with his knight, and the f6-square can be useful for the bishop when occasion offers. 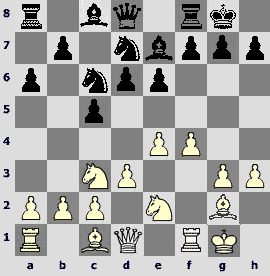 Its drawbacks are also obvious – Black pieces are somewhat crowded on the Q-side, but on the K-side the defenders are few. 10.f5!? A successful attempt to take the bull by the horns straight away. The struggle is calmer after 10.Ґe3. 10...b5? !It was worth it to prevent the knight from jumping on f4 by way of...¤de5!, and White would have to lose a tempo on 11.g4 in order to fortify the f5-pawn. Into the bargain, after g3-g4 queen cannot get to h5. 11.¤f4 e5? !Driving the knight to h5 and seriously weakening the d5-square. Thenatural-looking 11...¤de5 is stronger. 12.¤h5! g6! Emergency measures are in order. After 12...¤f6 13.¤d5! 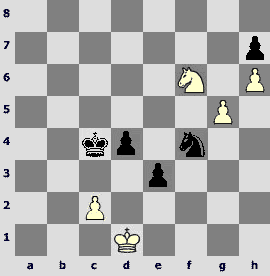 Black is in trouble: on 13...¤xd5 14.exd5 ¤a5 there follows 15.Ґh6! gxh6 (15...Ґf6 16.Ґxg7!) 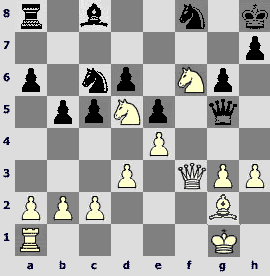 16.f6±, and on 13...¤xh5 14.Јxh5 there is a powerful threat 15.f6. 13.¤d5! Sergei Rublevsky plays the whole game under the slogan "forward only!" 13...Ґg5?! To accept the offer13...gxh5?! means an enduring white advantage: 14.f6! ¤xf6 (14...Ґxf6 15.¦xf6! ¤xf6 16.Ґg5 ¤xd5 17.Ґxd8 ¤xd8 18.exd5ќ) 15.¤xe7+ ¤xe7 (15...Јxe7 16.Ґg5) 16.¦xf6±. The best way is to hamper f5-f6 by a radical means – 13...f6! with a real threat to give short shrift to the insolent knight. I can see nothing decisive for White: 14.fxg6 hxg6 15.Ґh6 (15.Јg4 ўh7 16.Јh4 ўg8!) 15...¦f7 16.Јg4 ўh7 17.Јh4 (or 17.Јe6 Јe8, and bad is 18.¤c7? because of 18...Јg8! 19.¤xa8 ўxh6!°) 17...ўg8! 14.fxg6!Weaker is 14.f6?! Ґxc1 15.Јxc1 ўh8! 14...fxg6. On 14...hxg6 there is a strong reply 15.h4! Ґxc1 (utterly bad is 15...Ґe7? 16.Ґh6! gxh5 17.Јxh5 with a decisive white attack: 17...¤db8 18.¦f5! Ґxf5 19.exf5 Ґf6 20.Јg4+ ўh8 21.Ґxf8ќ) 16.¤hf6+ ¤xf6 17.¤xf6+ ўg7 18.Јxc1±. 15.¦xf8+ ¤xf8. A pretentious 15...ўxf8 does not help– after 16.Ґxg5 Јxg5 17.Јf3+ ўg8 18.¤hf6+ ¤xf6 19.h4 Јh6 20.Јxf6 Јf8 21.¦f1 Јxf6 22.¦xf6ќthe fundamentally important d6-pawn falls. 18...Ґb7? A careless answer. By immediately including the bishop into defense of his king by means of 18...Ґe6! Sergey Grigoriants could have seriously impeded the converting of advantage for his opponent. Now white pieces are quick to keep an appointment with the enemy monarch. 19.h4 Јh6. Or 19...Јd2 20.¤g4! (threatening 21.¦d1! and 22.Јf6+) 20...¤d7 21.Јf7 ¦d8 22.¤gf6ќ. Now we will see a really fine episode of Dmitry Bocharov's creative work. Learn to think concretely and fight for the initiative! 24...d5!Dmitry's decision, backed by a precise calculation of the variations, is really brilliant. 25.Ґxf6. In Black's favor is 25.e5 Ґc5+ 26.ўh2 (loses 26.ўf1 Ґc8! 27.exf6 Ґa6+ 28.¤e2 ¤xf4) 26...Ґf2! with an idea to place the knight on the e4-square with a check after the exchange on g3. On 25.exd5 there will follow 25...¤xf4 26.¦xe8 ¤xh3+! 27.ўh2 ¤xg5! 28.d6 Јb6, and White is again in bad shape – the rook hangs, and there is a threat of deadly check 29...¤g4+. 26.Ґh4. Any other retreat does not solve the problems as well: 26.Ґg5? ¤xh3+ or 26.Ґd4 c5! (26...¤xh3+ 27.ўh2) 27.Ґe3 (27.Ґf2 c4 28.Ґa2 ¦a8!) 27...c4 28.Јf3 ¤g6 29.Ґa2 ¦a8! – the light-squared bishop is trapped. 26...¤g6!White pieces have got entangled, and to restore their coordination is already impossible. 27.¤f5. In case of 27.exd5 ¦xe1+ 28.Јxe1 ¤xh4 the weakness of the dark-colored squares becomes a decisive factor. 28...Јg3! The finale is near. Black delivers his final attack in a burst of inspiration. 29.¤f3 Ґxh3 30.Јd2. 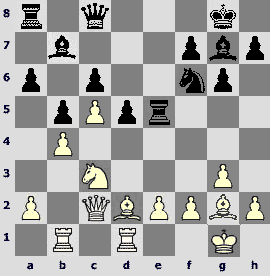 White could have dragged out his resistance a bit by means of 30.¦e2 Ґc5+ 31.ўh1 (31.ўf1 Јxf3+) 31...¦e6! 32.¤h2 (on 32.¤bd2 Ґg4 33.¤f1 there follows a telling reply 33...Ґxf3! )32...¦g6 33.Јf1 ¦f6 34.Јc1 Ґg4 35.Јe1 Ґf2 36.¦xf2 ¦xf2 37.Јg1 Ґh3! 38.gxh3 Јf4°. The position on the board is the sharpest one. White had sacrificed his two pawns and got in return a powerful protected passed pawn in the center together with the prospects of an attack on the weakened enemy king. Still it won't do to underestimate the black pawn avalanche on the Q-side. Objectively speaking, black arguments are weightier. 27.Јa2. 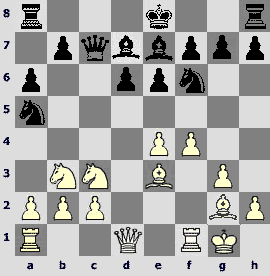 White's idea is simple: to swap places of his queen and bishop and to create mating threat. 27...a4. But the a5-pawn did not need protection! Stronger is 27...¤c5!, and if 28.Јxa5?, then 28...Јxa5 29.¦xa5 Ґd2! 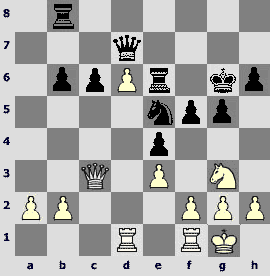 30.¦e2 ¤xe4 31.¦xe4 b3 32.¦xb5 ¦b8° with Black's win. 29...¤c5? ?Probably the most unfortunate blunder of the tournament. After 29...ўg7! 30.Јe4 ¦h8 White has nothing better than 31.Јxb4, and then it is possible to play 31...¦c4 32.Јb2 Јd4 – Black should convert his material advantage. And in conclusion there is a selection of endgames, and more specifically of rook-and-knight endings, which illustrates the point that even in simplest situations with minimal number of pieces on the board one should keep his concentration and lucidity of mind. 71.g7?! A hard-to-explain move. 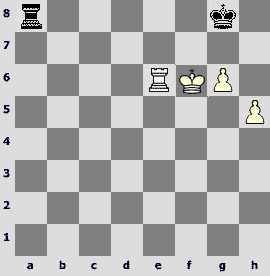 After 71.h6ќthere is nothing much to comment on, you could find this position in every textbook on rook endings. 71...ўh7 72.¦e7 ¦a2 73.ўf7?An unexpected surprise for the opponent. Wins 73.h6! ¦f2+ 74.ўe6 ¦e2+ 75.ўf7 ¦f2+ 76.ўe8 ¦f1 (if 76...ўg8, then 77.ўd7 ¦d2+ 78.ўe6 ¦d8 79.ўf6 ¦a8 80.¦e6 ўh7 81.ўf7) 77.¦f7 ¦e1+ 78.ўd7, and the king approaches the enemy rook with subsequent ¦f8. 71...¦a3+? In order to defend himself successfully in such endgames the weaker party has to determine a correct place for the rook. Here an attack from the rear is needed. The only way to draw is 71...¦a1! 72.ўh4 (если 72.¦xf5, то 72...¦g1+! 73.ўf3 ¦f1+! 74.ўg3 ¦g1+ 75.ўf2 ўe4!= ) 72...¦g1! White king cannot get to g5, and on 73.¦xf5 there follows 73...ўe4=. 72.ўh4 ¦e3 73.¦xf5 ¦e8. 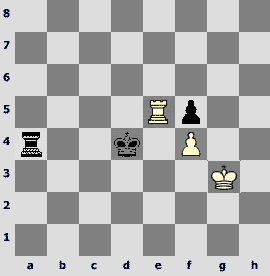 The head-on attack won't work, as the king is cut off along the 5th rank. 73...ўe4 74.¦f8! (there is already no move 74...¦e1) 74...¦f3 75.ўg4ќ does not save either. 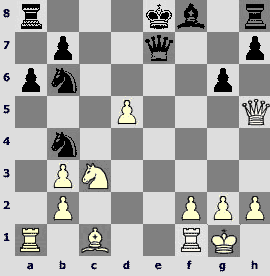 In this sharp knight ending Black's chances are better as his passed pawns are supported by the king. 49.¤xh7? d3° is obviously bad. White has to find the only way to draw. 49.g6?Here the activity is inappropriate. The salvation is 49.¤e4! d3 50.cxd3+ ўxd3 51.¤g3 ¤g6 52.¤h5 ¤h8 (52...¤e5 53.¤f4+ ўe4 54.g6! ; 52...e2+ 53.ўe1 ўe3 54.¤g3) 53.ўe1 ¤f7 54.g6 hxg6 55.¤f4+ ўe4 56.¤xg6 ¤xh6 57.¤h4=. 49...¤xg6 50.¤xh7 d3 51.¤g5.In case of 51.cxd3+ ўxd3 52.¤g5 e2+ 53.ўe1 ўe3 mate in two moves is inevitable. Taking advantage of the opportunity, I'd like to congratulate all those who have won their Superfinal berths, upon their fine performance.